For only being 84 pages, this little number packs an awesome message about building community around purpose. Mrs. Robinson dissects not the how or why community building is powerful but what makes a community ... a community. 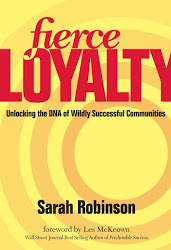 Community creates fierce loyalty through belonging, predictable connection, and passion and pride. A community is brought together by common grounds of need, desire, and direction which creates an almost organic growth in masses. Companies like Harley-Davidson and Ikea, and organizations such as TED are living examples of how community can create fierce loyalty. I am excited to merge this idea with my business - the components are there, we just need to harbor them. Stay tuned! Oh, and of course read it.